After my last post (wow, almost a month ago now) I realized that I lied to the tens of my readers. I actually did bake something in the time between Christmas and that post. I had just completely forgotten. 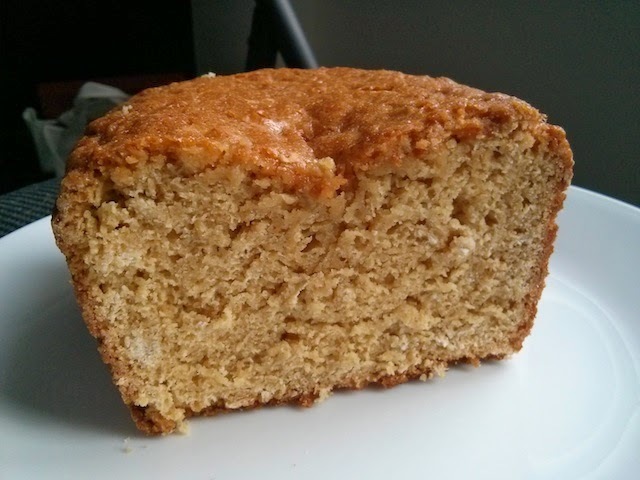 And not for any good reason, this was an excellent recipe that delivered in pretty much every way you could want a maple oatmeal bread to deliver. I mean, I'm writing a post about it, so that must mean something. There is a caveat to this recipe, it requires a lot of maple syrup; like a lot. And I'm not sure if you know this, but maple syrup ain't cheap. However, I was looking for a way to use up the rest of my maple syrup as it was set to expire. Don't roll your eyes, I know that the expiry dates for things like maple syrup are complete lies, but it gave me an excuse to use maple syrup with reckless abandon so I took it. Amusingly, I still ended up with syrup left over; it's still in my fridge. I've baked quite a few maple items in the past; usually cookies, but also pies and cakes, and I'm well aware that the payoff for maple flavour can be quite low. Even when using Grade B/No. 2 Amber (or Dark if going by the new standards) you don't get that punch of maple flavour that you really want, and very rarely on the first day. To combat this, and to use as much maple syrup as possible, I dumped two cups of it into this recipe, removing the milk in kind. In order to balance what I was hoping would be a robust maple flavour, I added oats instead of nuts. Besides, it doesn't get much more classic than that. I was pretty unsure if bread was going to bake. The batter was quite loose, but whatever, no risk no reward right? Into the oven it went. At the very least the house would smell pretty good. And good it did smell, and perfectly it did bake. No one was more shocked than I. It continues to amaze me how much I can mess with something and still have it turn out so well. I made sure to taste the bread every day until it was finished. I know what you're thinking, "he's very dedicated to science," and you're right, but I thought it only right to share and I'm not that much of a pig (well, not always). The bread was quite moist and very soft, but despite the amount of maple syrup, you are not hit with a tonne of sweetness. It was actually quite mild, with the oats helping to balance both the sweet and the texture. Yet, the maple flavour was still pretty muted, it was definitely there, but not as prolific as you might expect for two cups of the stuff. Don't get me wrong it was excellent and as predicted, Day Two, the maple flavour was richer; Day Three, it was at its best. I couldn't have been happier with this recipe. I mean, I could complain that the maple wasn't as intense as I would like, but I have resolved myself to the belief that this is a property of maple syrup. Although, I am very interested in trying the recipe with Grade B/No. 2 Amber/Dark syrup and am looking forward to Farmers Market season so I can pick up 50 or so litres for a decent price. P.S. Pardon the picture, I can't find my camera. Preheat oven to 325F and line the bottom of a 9x5" loaf fan with parchment paper and grease pan. In a medium bowl add flour, baking powder and salt and whisk to combine. In a large bowl add maple syrup, eggs and butter and whisk until completely combined. Add dry ingredients to wet and stir until no clumps of flour remain. Fold in oats until combined. Pour batter into prepared pan and bake for 1 hour 15 minutes or until toothpick comes out clean. Allow to cool in pan on rack for 15 minutes before removing loaf to cool completely. Ha!! One of tens!! I'm lucky if I have that many!! I love maple bread and enter it every year in the State Fair. It has won nothing, Blue, Red, and then nothing. I do use maple extract though. I wonder why maple syrup is subtle when baked? It is NOT subtle when poured as a vanilla ice cream topping. It is delicious!! Anyhoo, back to your post, your recipe looks simple and those are usually the best!